This is just lovely – thank you for sharing. This is gorgeous and I love the colors, especially the golds, really stunning with the reds and greens. Good job! Love the design! I love this. Of course, I am a machine embroidery addict. (I am entry 21, which everyone thinks is a panel) I am so glad I found your site because I am trying to learn MEA. No local classes so I am in my own. So, you have a new follower. ooohhh lovely and I love how you decided to do a bigger version! Beautiful work and such a lovely result. A lovely piece for Christmas. Gorgeous. What beautiful work you did on this. That is beautiful as is the bigger sized quilt. Your table will look gorgeous with a table topper like that. So pretty! I love the quilt, too, that’s in progress. 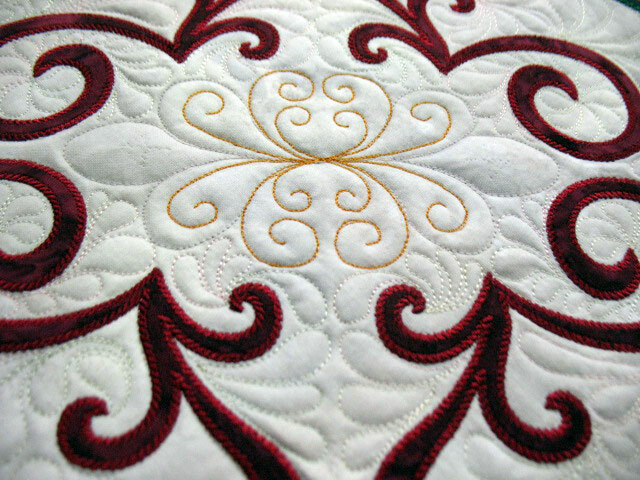 I really admire the gorgeous embroidery quilting that people do. Sure wish my machine could do that! 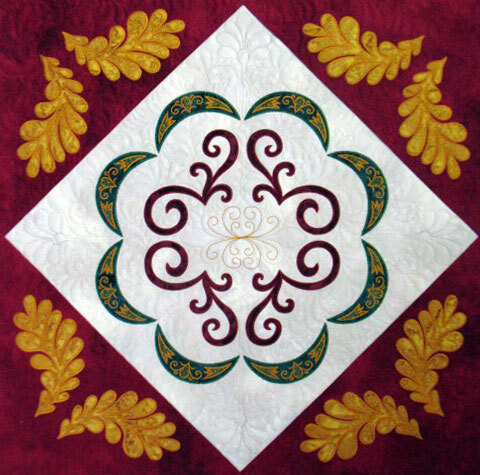 Fantastic, stunning quilt! 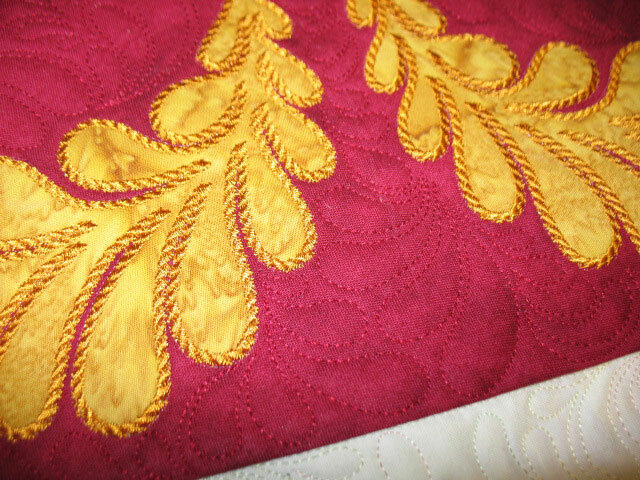 Love your fabrics and your quilting is superb! 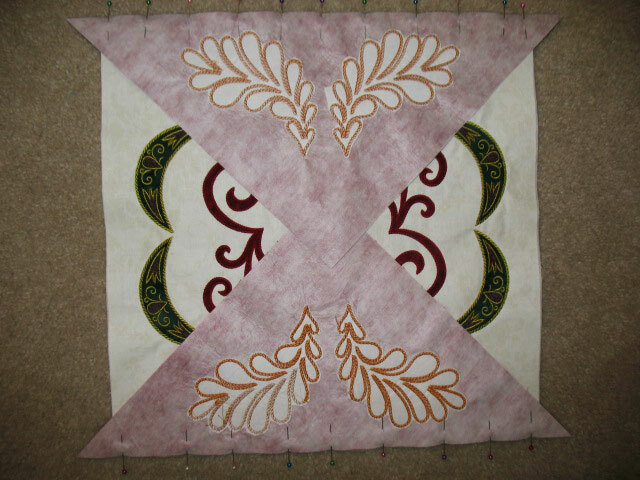 I’ve been following all the FMQ tutorials at SCG all year and have just read yours. It looks great and covers stuff we haven’t done yet. I also have been viewing the videos on your website and want to thank you for your tips and inspiration it’s all VERY helpful to me, the novice. Such a beautiful wall hanging! Can’t wait to see the quilt in progress all done. 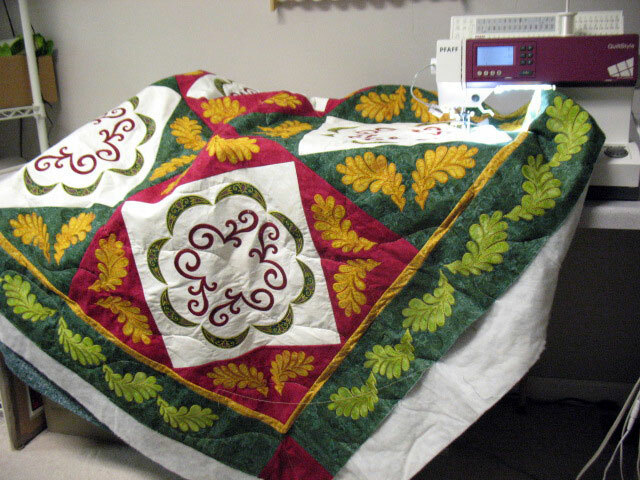 Great work…and just love the quilting. 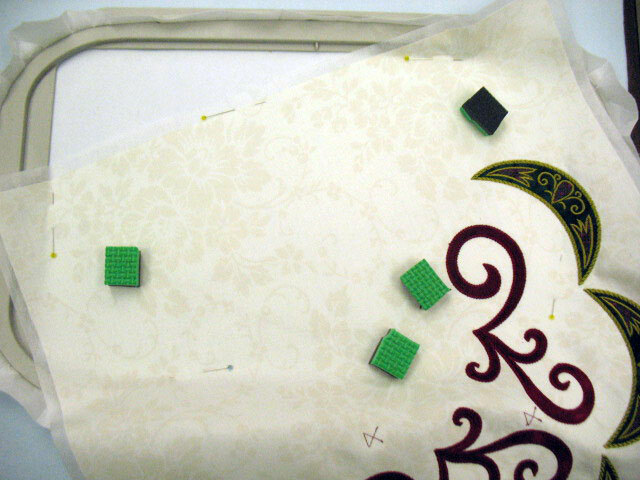 Also, thank you for the tutorial over at SewCalGal. I often stand in front of a border and have absolutely no clue. While I am not formally participating in the challenge, I will work through your tutorial to try a few different things. Just found time to visit the entries in the 2012 Christmas Quilt Show. Love your quilt. Absolutely beautiful. 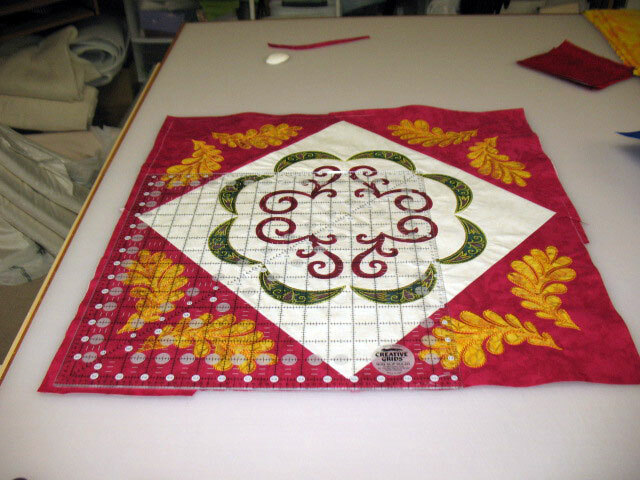 One of the best quilts I’ve ever seen that incorporates beautiful machine embroidery, free-motion quilting and it also has stunning overall design and visual impact. Can you tell I love it? LOVE IT! Had not heard about foam pin anchors. Very interesting. I definitely want to give them a try. 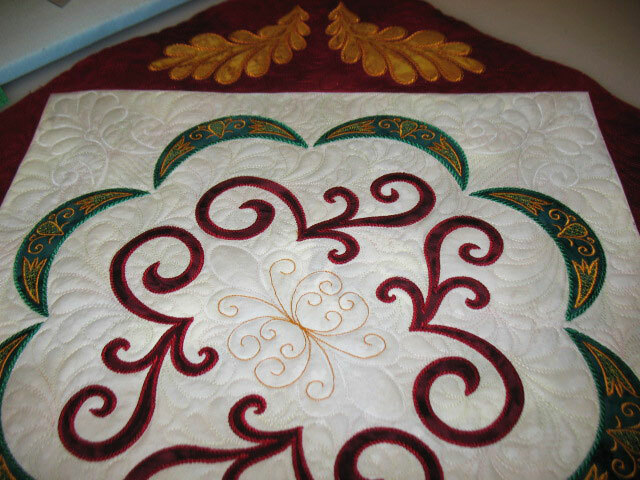 Thanks for sharing your insights and your regal Christmas quilt. Beautiful quilt and thanks for showing all the close ups .